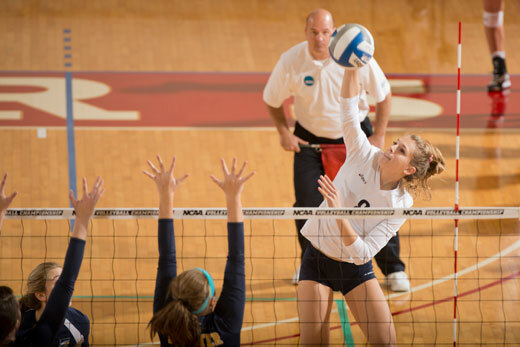 Senior outside hitter Leah Jacobs was one of two Emory volleyball players selected as a First Team All-American. Junior goalkeeper and women's soccer team captain Liz Arnold finished the year ranked 15th among Division III players and was named to the Capital One Academic All-District Team for her athletic and academic success. Paced by junior All-UAA First Team selection Matt Sherr, the Eagles men's soccer team shutout nine opponents in 19 games. 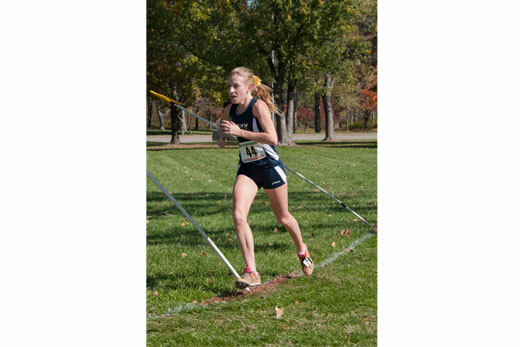 Senior Tamara Surtees was named the women’s cross country team's MVP for the second straight year. She was a First Team All-University Athletic Association honoree, the program’s first since 2008, and garnered NCAA D-III All-America honors. 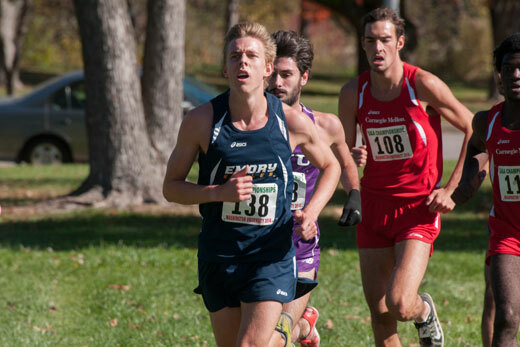 Junior Lukas Mees was named the Men's Cross Country team's Most Valuable Runner after ranking among the squad’s top three finishers in all eight competitions. 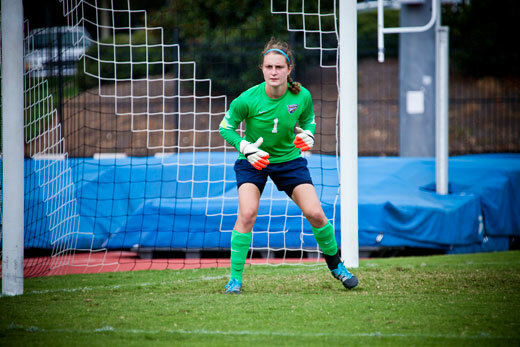 As the semester winds down, Emory's fall sports teams are celebrating successful 2014 seasons, including trips to national championship tournaments. This season, Emory's volleyball, women's soccer, men's soccer, women's cross country and men's cross country teams all advanced to their respective NCAA Division III Championships, with the volleyball team playing in the title match. The 2014 Emory volleyball team maintained its status as one of the premier programs after establishing a school season record for victories while making another deep run in the postseason, culminating with a berth in the title match of the NCAA D-III Championships. The Eagles concluded the year with an overall record of 39-4, the eighth straight year and the 16th campaign of 30 or more victories during the 19-year tenure of head coach Jenny McDowell. The team's final win count represented the program's 21st consecutive winning campaign. Emory's appearance in the NCAAs marked the 19th straight year for landing a berth in the postseason. The Eagles were sent to Saint Louis for NCAA Regional action where they defeated Webster University and Thomas More in the first two rounds, setting up an epic battle against University Athletic Association foe and No. 7-ranked Washington University. The two heavyweight programs slugged it out over five grueling sets before Emory emerged with a 3-2 victory, propelling it into the quarterfinal round in Newport News, Virginia. After registering 3-1 decisions over Williams College and UW-Stevens Point, Emory battled No. 2-ranked Hope College for the national crown. After dropping two of the first three sets, the Eagles found themselves down by a 17-10 margin in the fourth set before stunning the Flying Dutch with a furious rally that forced a fifth game. In the deciding set, Hope got off to a big lead and held off Emory to claim the championship. As usual, Emory played a demanding schedule, squaring off against 11 Top 25 programs and registering an 8-3 won-lost mark in those affairs. In addition, the Eagles played 12 matches against 11 teams that earned bids to this year's NCAA Tournament, posting a 10-2 record in those games. Along the way, Emory brought home the University Athletic Championship, its fourth league crown in the past six campaigns, defeating the University of Chicago in the finals. Emory had a number of players recognized for their outstanding play, highlighted by the selections of junior Sydney Miles and senior outside hitter Leah Jacobs as First Team All-Americans as selected by the American Volleyball Coaches Association. Sophomore middle hitter Jessica Holler and senior libero Kate Bowman were the Eagles' Division III-leading third and fourth All-Americans, with Holler a second-team selection and Bowman a third-team choice. Head coach Jenny McDowell was selected as the South Region Coach of the Year for the sixth time during her stint as Eagles' head coach, and also chalked up a milestone when she notched 600th career win on Oct. 5 following a victory over Carnegie Mellon University. McDowell closed out the 2014 season with a school and career slate of 618-143. The Emory University Women's Soccer Team suffered just one loss in the regular season, en route to qualifying for the NCAA Division III Championships for a program-record fifth-consecutive season in 2014. The Eagles finished the campaign with an overall record of 11-2-6, marking the program's seventh double-digit win total in the last eight years. Included in the overall ledger was a 2-1-4 record in University Athletic Association (UAA) games, good for a fourth-place finish in the conference standings. Emory's schedule ranked among the strongest in the country, facing five teams that were ranked in the final national polls, and going 2-1-2 in such contests. The team's signature win of the season came on the final day of the campaign, when the Eagles defeated then fourth-ranked Carnegie Mellon University 1-0 in Pittsburgh. The Eagles also extended their regular season home winning streak against non-conference opponents to 71 games, going 4-0-1 in such games to improve to 64-0-7 against non-conference teams at the Woodruff P.E. Center since 2000. Emory's season came to a close in the first round of the NCAA Division III Championships, with the squad suffering a 1-0 loss to Kenyon College in Crestview Hills, Kentucky. The Eagles received votes in the final National Soccer Coaches Association of America (NSCAA) Poll, and were ranked 22nd in the D3Soccer.com poll. Emory's defense once again ranked among the strongest in Division III, with the team finishing the year ranked 13th in the country with a 0.438 goals-against average. Led by NSCAA All-South Atlantic Region Third Team defenders junior Ally Peterson and senior Kaelyn Lucas, the Eagles recorded 11 shutouts in 19 games, yielding just nine total goals. Junior goalkeeper and team captain Liz Arnold finished the year ranked 15th among Division III players with a 0.491 goals-against average and 55th with a .850 save percentage. Offensively, all-region second team selection Emily Feldman paced the Eagles with a team-high seven goals during the year. The senior added on a pair of assists, and finished the season tied for sophomore Cristina Ramirez (five goals and a team-high six assists) with the team lead with 16 points. Other double-digit point scorers for the Eagles included seniors Karina Rodriguez (six goals and two assist) and Charlotte Butker (four goals and four assists) and freshman Kaitlyn Dorka (three goals and four assists). Led by one of the top defensive units in the country, the 2014 edition of the men's soccer team finished with a 13-4-2 record, and qualified for the NCAA Division III Championships for the 15th time in the program's history. The Eagles' regular season began with an 11-game undefeated streak and included a 10-match winning streak (tied for the third-longest in school history). Emory also went 3-3-1 in University Athletic Association (UAA) games during the year, good for a third-place finish in the conference. The Eagles were ranked as high as sixth in Division III during the campaign, and entered the NCAA Tournament as the country's 11th-ranked squad. Emory received an at-large bid to the tournament, and was selected to host the first two-rounds of the NCAA Championships, drawing Berry College in the opening round. The Eagles led by a goal in the waning minutes of regulation, but Berry scored late to tie the match, and again with three minutes left in the second overtime period, to deal Emory a heartbreaking loss. Emory's 13 wins were the most recorded by the team in a season since the 2010 campaign, and marked the program's 13th-consecutive year with a double-digit win total. The Eagles ended the year ranked 24th in the final National Soccer Coaches Association of America (NSCAA) Division III poll. The team's success was due in large part to its defense, which finished the campaign ranked 16th among Division III squads with a 0.60 goals-against average. Paced by junior All-UAA First Team selection Matt Sherr, sophomore second-team honoree Scott Haley and senior all-conference honorable mention Noah Rosen, the Eagles shutout nine opponents in 19 games, the team's most since the 2010 season. Junior goalkeeper Abe Hannigan, an All-UAA Honorable Mention, finished the year ranked 32nd in Division III with a 0.635 goals-against average. 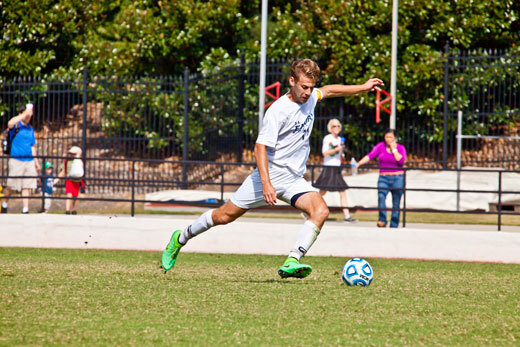 Offensively, the Eagles were led by junior Sebastian Hardington, who scored seven goals (including the team's only goal in its NCAA Tournament match) and assisted on two others for 16 points. Senior Dylan Price added on five goals and five assists for 15 points, while sophomore All-UAA Honorable Mention Jason Andrejchak rounded out the Eagles' double-digit scorers with four goals and a team-high seven assists for 15 points. In addition to their athletic success during the year, both Price and Sherr were named to the Capital One Academic All-District Team for their achievements in the classroom. It marked the second straight year that Price had been recognized with the award, while Sherr picked up his first career honor from Capital One. Making the most of its experience and hunger to succeed, the women's cross country team continued its reign as one of the top program's in the region while winding up the regular season ranked 23rd nationally. The Eagles brought home their second NCAA South/Southeast crown in the past four years, easily topping a 29-team field, and made their 10th straight appearance at the national championships. All totaled, Emory captured five first-place team finishes during the season including at the Furman Classic and Gulf Coast Stampede, and also claimed third at the University Athletic Association Championships, a four-spot improvement from 2013. Senior Tamara Surtees was a standout performer during the year, pacing the Eagles' effort in their final seven races. Named the team's MVP for the second straight year, Surtees was a First Team All-University Athletic Association honoree, the program's first since 2008. She raced to all-region recognition for the fourth straight year and her 34th-place showing at the NCAA D-III Championships enabled her to garner All-America honors, the first Eagle to earn that distinction since 2006. Senior Marissa Gogniat played a vital role in the team's success, placing among the Eagles' top three runners in every competition and finishing runner-up to Surtees in six events. Gogniat was one of the squad's six all-region performers, registering an eighth-place finish out of 205 contestants at the NCAA South/Southeast Championships. Freshman Halle Markel was chosen for the Most Outstanding Newcomer Award after scoring in six of her seven races. Markel was exceptional at the NCAA South/Southeast Championships, clocking a season-best 6K time en route to a 13th-place finish that enabled her to claim all-region accolades. Senior Elise Viox scored in four of the squad's six 6K events en route to receiving the Coaches' Award, symbolic of leadership, dedication and inspiration. Viox earned all-region kudos for the second straight season after turning in a personal-best effort at the competition. Rounding out the team's award winners as the Most Improved Runner was junior Julie Williamson. A combination of battle-tested veterans along with a batch of talented newcomers helped the men's cross country team evolve into a solid group by season's end. The highlight of the campaign came at the NCAA South/Southeast Regional Championships where the Eagles captured first place out of 28 teams, the program's first title since 2009. With their performance at the Regional Championships, Emory earned its second straight automatic berth to the NCAA Championships. Junior Lukas Mees was named the team's Most Valuable Runner after ranking among the squad's top three finishers in all eight competitions. Mees landed Second Team All-University Athletic Association honors following his outing at the conference championship, and raced his way to All-South/Southeast Region acclaim after crossing the finish line in ninth position out of 201 entries. Seniors Alex Fleischhacker and Tyler Cooke were solid in their final campaigns with the pair scoring in every meet. Fleischhacker was the team's top runner on three occasions, including at the national championships, and brought home all-region accolades for the third time during his career. Cooke ranked among the Eagles' top three in six competitions and was their No. 1 finisher at the Oberlin Inter-Regional Rumble. Cooke was the recipient of the program's Coaches' Award, symbolizing leadership, dedication and inspiration. Sophomore Grant Murphy emerged as a bona fide contributor, scoring in every competition and pacing the contingent at the NCAA South/Southeast Regional Championships with a personal-best time that placed him sixth in the 201-runner field. For his efforts, Murphy was tabbed as the team's Most Improved Runner Award winner. Freshman Jordan Flowers was the top-performing rookie, scoring for the team in seven of his eight outings. Flowers, selected as the Eagles' Newcomer of the Year Award recipient, was one of six Emory representatives who ran his way to all-region honors.